Anyway - today is St. Patrick's Day which happens (despite my co-worker Eli's arguments) every March 17th. And, as someone who has NO Irish blood in them at all - I think I've developed an affinity for the culture. In elementary school - today was dominated by the Irish Jig Contest which.was.FIXED. I swear. I never won, which is ridiculous because I am/was/will ever be a Phenomenal Irish Jigger (which is not something you should say quickly as you will raise eyebrows of consternation). Anyway, some years I would make it to the finals and then lose. Because, see, the preliminary round was judged by the teachers and high-school teacher helpers, who tended to be fairer judges as they were so burnt out they didn't really care that much. The finals were judged by the Specials Teachers (who we should have just called The Russians to get it over with) and they picked the same two kids every year. It was such bull crap. And the winners got these ceramic shamrocks that the art teacher made, and I coveted one of them with my whole heart and never won. And believe it or not, that probably had a more profound influence on why I am the jaded bitter d-bag I am today, that you think. St. Patty's Day didn't really matter again until college (duh). My first two years of college I didn't drink much due to my lack of friends and lack of proper identification. My junior year I cleared all that up and became a raging st. patty's day lunatic. It wasn't until my senior year that there was any photographic evidence though. I'm not going to lie - I miss the age where digital cameras were a rarity and posting photographs on the internet even more so...at least back then when I did dumb stuff you had to be there to witness it. Now let me be straight - in case you're reading this because you want to offer me a job or marry me or something in the future - I never did anything illegal. I mean, I probably jaywalked, but that's it. Everything else was totally above the bar/wire/thing that keeps you from getting arrested. What happens is that the rules of proper social conduct go out the window. I tend to find it acceptable to take (normally with some sort of verbal permission) people's clothing or accessories. I have a habit of throwing things- mostly in celebration. I have no qualms about demanding that people give me things, or do things I think would be entertaining. This is a very broad overview of my behaviors- and if you want more details - feel free to email me (as most of my SPD stories are hilarious but totally inappropriate for a blog my parents read). 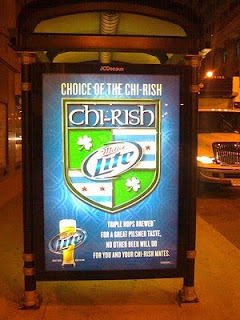 I shall give you one example - last year, St. Patrick's Day itself was fairly tame - we went to the South Side Parade the weekend before which really demands its own personal blog due to its enigma-ness. And then the night of, Boyfriend and I were just trolling the streets of Wrigleyville looking for some cornbeef and cabbage (for him) and a salad/cheeseburger (for me). We finally found a place and many of the people around were wearing the Chi-rish beads I had been lusting after most of the week. Those Miller Lite marketing people are flipping geniuses. This is a fantastic ad campaign. Hats off. Anyway, there were mardi gras-esque beads with the Chi-rish emblem on them and at no point did I see them passed out. People just had them. And I wanted them. So after we had eaten dinner and are still relatively sober, we're heading to our next destination, I find a cop on the street outside the bar wearing one of the Chi-rish bead necklaces. Rachel: Excuse Me. Where did you get those beads? Cop: I don't know, someone just gave them to me. Rachel: Can I have them? Cop: Sure. Happy St. Patrick's Day. And with that, they were mine. On a normal day - I don't ever walk up to cops unless, you know, I'm a victim of a crime OR they're Chris Meloni. But because of the date, this felt perfectly acceptable. So now I have Chi-rish beads which aren't quite a ceramic shamrock necklace, but then again - I'm Italian, so I'll take what I can get.